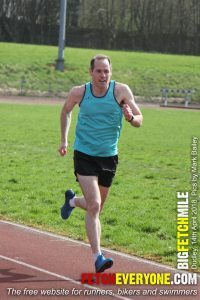 Dave Powner reports: This low-key event was a great opportunity for me to have my first ever attempt at the mile. After a brief stint of supporting at the National Road Relays, I jumped on two trains and then two busses to get to the Dell Stadium track in Dudley. There was an expected field of around 50, of which my predicted time of 5:30 would see me taking part in the last-but-one heat, ordered from slowest to fastest. A slight hiccup catching the 226 in Merry Hill led to me arriving 15 minutes later than hoped, just in time to see the fastest runners shaking hands around the finish line. Fortunately, “Fetchies” are a friendly fraternity, and the race organiser allowed me to take part in one last heat, all on my own. With a slight feeling of guilt, I didn’t spend very long warming up, which is not wise for such a short race! I set off in the sunshine, buoyed by the enthusiastic support from the earlier runners who were tucking into their cakes in a manner reminiscent of our own club. Each time I came down the home straight where the crowd feasted, the noise increased. I guess more of them had finished their cake. As the metaphorical bell rang, I didn’t feel the urge to kick – No-one was chasing me, and I had no-one to catch. And a part of me started looking ahead to the following day’s two track events in Tipton. I crossed the line with a time of 5:41, which I was happy with under the circumstances. I felt no ill-effects from the race, and with experience gained and lessons learned, I’ve got a time I know I can beat when I do this distance again. This entry was posted in Race Reports, Track by BvH Admin. Bookmark the permalink. Well done, Dave. Not the best prep for a race, and you did really well. Next time you’ll have people to run against and that will make all the difference. I hope they left some cake for you!